Cruise ship passengers arriving in Lisbon are in for a treat as their vessel enters the Tagus River estuary from the Atlantic. 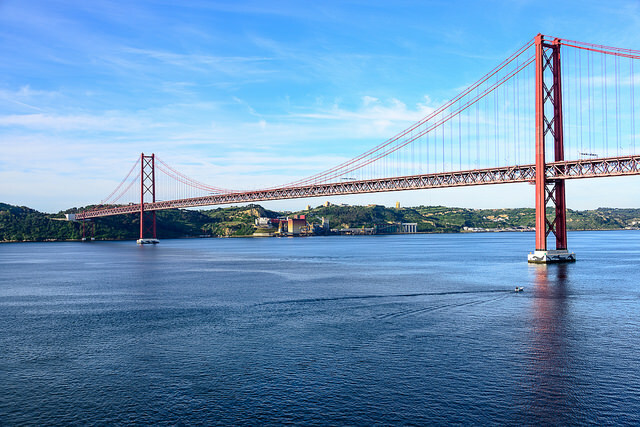 Heading upriver your vessel will approach the magnificent Ponte 25 de Abril bridge which is so reminiscent of the Golden Gate bridge in San Francisco. Passengers will also see the statue of Christ the Redeemer overlooking the city before docking at one of two main areas dedicated to cruise ships. The city itself is a charming destination filled with reminders of grandeur from its colonial past. Such opulence in its architecture is at times surprising considering that much of the city was destroyed by an earthquake in 1755. Whilst visitors can walk around the tourist attractions surrounding Praça do Comércio in the city centre, Lisbon is not a city to explore on foot. Known as the ‘City of Seven Hills’ there’s an extensive transport network including trams and funiculars which make it a unique European destination for getting around. For visitors interested in heading out of the city there are some first class shore excursions available including ones to the UNESCO World Heritage Site of Sintra and to the pilgrimage site of Fatima. There are a number of possible docks where you might arrive in Lisbon depending on the size of your cruise ship and the volume of maritime traffic. The most convenient option for getting into the city is the dock at Santa Apolonia although the Alcantara dock which is a little further away from the city centre is hardly a problem as it’s really well connected. Santa Apolonia Terminal: Lying less than 2km north-east of Praça do Comércio on the Tagus River this is the most convenient dock for cruise ship passengers. It consists of three adjacent docks which share the same terminal building: Santa Apolonia, Santa Apolonia Jusante and Jardim do Tabaco. The modern terminal building known as the ‘Terminal de Cruzeiros de Santa Apolónia’ is well equipped for passengers. You can simply walk to Praça do Comércio from the cruise terminal or take a short ride on the metro. The Santa Apolonia metro station (blue line) is just across the road from the cruise terminal. Take a train marked ‘Amadore Este’ for just three stops to Restauradores which is right in the city centre. Alternatively, you might dock closer to the Terreiro do Paco metro station in which case the instructions are the same except that it’s just two stops to Restauradores. This stop is also the location of the Rossio train station from where there are regular services to Sintra. Alcântara Terminal: Located approximately 5km west of Praça do Comércio, close to the iconic Ponte 25 de Abril bridge, this dock is a little further from the city centre but is still very well connected. It consists of the Alcântara and the da Rocha Conde de Obidos docks which share the modern ‘Terminal de Cruzeiros de Alcântara’. For getting into the city there is no metro station nearby so you’ll need to walk to the nearby Alcantara-Mar train station which runs along the coast from Cascais to Cais do Sodré. From here you take a train for just two stops east to Cais do Sodré where you get off and join the city’s metro system (green line). Take a metro train marked ‘Tehlheiras’ for two stops to Rossio which is in the city centre. It’s also the station for services to Sintra. Easier still is to simply walk the 1km from Cais do Sodré station to Praça do Comércio. Walking: Whether you walk, take public transport or arrive on a shuttle bus provided by your cruise line it’s well worth considering Praça do Comércio as your point of reference. 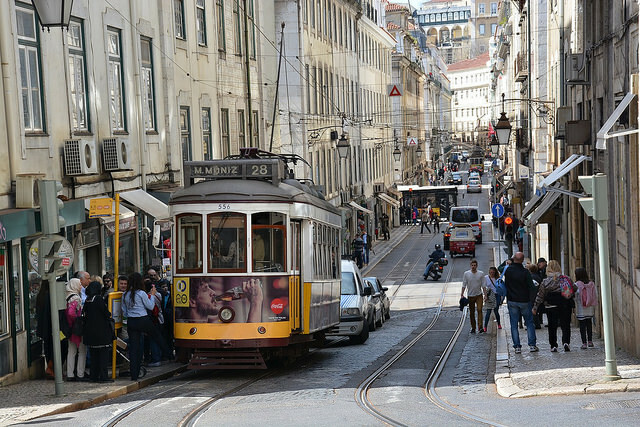 From here many of the city’s main sights are within walking distance along with Avenida da Liberdade to the north-west which is home to some of the city’s best hotels and upmarket shopping. Public Transport: Beyond the immediate centre the city is very hilly and walking isn’t recommended so if you’re going to travel further afield you should buy a day pass at a ticket machine which will give you unlimited travel on the city’s metro, tram and bus network as well as the funiculars. There’s an explanation of ticket types and fares on the Carris Website. This is the company which operates Lisbon’s public transportation network. Be sure to validate your ticket at the ticket machine when you board one of these forms of transport as fines for not doing so are severe. For transport beyond the urban area you will need to buy separate tickets. Tourist Bus: Lisbon’s hop-on, hop-off bus service is a very popular option amongst cruise ship passengers allowing visitors to see as much as possible in a short time. There’s a blue route and a red route and bus stops outside both cruise terminals as well as in Praça do Comércio. Opinions vary as to whether such transport is to be recommended in Lisbon: Some cruise passengers swear by the service whilst others complain of long queues and waits at bus stops preferring instead to arrange a taxi tour with a local driver. This is the city centre area which has been mainly rebuilt since the the 1755 Lisbon earthquake. 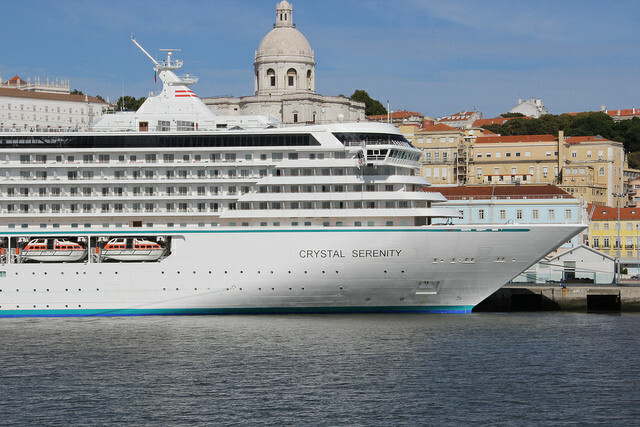 Most cruise passengers arriving Santa Apolonia Terminal will make their way to Praça do Comércio which is one of the main squares in this neighbourhood. A guided sightseeing tour of Lisbon’s main sights including a port pick-up is available in the company of an expert local guide. Praça do Comércio: If you arrive at the Santa Apolonia Terminal you are within a short stroll of Commerce Square which once served as the centre of commercial activity for traders arriving on the Tagus River to its south. The other three sides consist of traditional buildings which overlook the statue of King José I which stands in the centre. The square is a great meeting point for cruise ship passengers and important transport hub from which trams head west to the Belém district and ferries cross the river. Rossio Square (Praça de Dom Pedro IV): Lying just three stops from Santa Apolonia metro station, this is perhaps the most popular square in Lisbon as well as the busiest. Rossio is the place to truly drink in what it’s really like to live in Lisbon watching tourists and locals come and go from any of the several sidewalk cafés. Virtually all forms of transport stop at Rossio so it’s a great place to look for if ever you find yourself lost in the city. The Belém district of Lisbon is very close to the Alcântara cruise dock lying just one stop west from Alcantara-Mar train station. It is home to some of the city’s most popular tourist attractions including the Jerónimos Monastery, the Monument to the Discoveries and Belém Tower. For passengers arriving at the Santa Apolonia dock it is most convenient to take tram line 15 from Praça do Comércio, getting off at Mosteiro dos Jerónimos. This service begins at Praça da Figueira (next to Rossio Square) and runs to Algés train station. Jerónimos Monastery (Mosteiro dos Jerónimos): Also known as the Hieronymite Convent, the Jerónimos Monastery was also built to commemorate Vasco de Gama’s return from India. The vast building, which contains the Church of Santa Maria, the monastery, a sacristy, and a refectory, is one of the most magnificent and ornate constructions in the Manueline style, from the gables and mouldings on the entrances to the royal tombs found inside. It is also legendary for having survived the 1755 earthquake with hardly any damage. Monument to the Discoveries (Padrão dos Descobrimentos): A spectacular vision at the mouth of the Tagus River is the Monument to the Discoveries, standing 52 metres tall, with sculptures of some of Portugal’s most important personages during the Age of Discovery, led by Henry the Navigator, who first sponsored the adventures of the time. Belém Tower (Torre de Belém): If you arrive at the Alcântara Terminal you are only 5km east of this important symbol of Lisbon so might decide to pay it a visit before heading into the city centre. The Belém Tower was originally built as a lighthouse and fortress for Manuel I which was built in tribute to Vasco de Gama to welcome him from his successful discovery of the route to India. The tower was the site of many other significant events in Portugal’s history. Although constructed for and used as a defensive fortification, with a bastion that had two floors for guns and artillery placement and a four-storey tower measuring 35 metres high, the architecture is richly decorative, with sculptures, arched windows and cupolas. Lying a short distance north-east of the Baixa district this is the city’s oldest neighbourhood made up of winding, narrow streets packed with historical sights which survived the Lisbon earthquake. St. George’s Castle (Castelo de Sao Jorge): There are several castles and palaces in Lisbon but the fortress that is St. George’s Castle is a must to visit especially as it offers one of the best views of the city of Lisbon. The castle was, at different points in time, home to royalty and a prison. Although it was reconstructed after the 1755 earthquake the castle was completely restored to its original design to preserve its historic importance. National Pantheon of Santa Engrácia (Igreja de Santa Engrácia): Now a shrine in tribute to Portugal’s national heroes and former presidents, Igreja de Santa Engrácia was once a church with an interesting story – it had a curse that prohibited the completion of the building for centuries. In Portugal when anything takes too long to happen it is thought to be the doing of Santa Engrácia. Only when it was reconstructed as a pantheon for heroes was the building finished. Its dome can also be investigated giving fine views not only of the city outside but the rest of the building within. Gulbenkian Museum Museu Calouste Gulbenkian: The legacy of Armenian magnate Calouste Gulbenkian is perhaps the most important cultural Centre and foundation in Portugal. In accordance of his last will Gulbenkian left his estate to the people of Portugal, including an immense collection of major paintings from different periods and the museum houses these as well as a growing number of Portuguese art. The Centre also functions as a performance venue with theatres and concert halls and its own library. National Tile Museum (Museu Nacional do Azulejo): The azulejo, a beautiful ceramic tile, has been used for over five centuries to line the interiors of not only typical Portuguese households but also churches, palaces, and even train and subway stations. Although you won’t miss seeing examples of the azulejo on your trip to Lisbon you ought to still visit the Museu Nacional do Azulejo, which houses the biggest and most varied collection of tiles in the world. The National Tile Museum significantly relates the evolution of styles of the azulejo as it displays the histories of the tiles through the centuries. Formerly a convent, the Convento da Madre de Deus is also a tourist attraction on its own. If you have extra time in Lisbon you might consider a picturesque train journey along the coast from Cais do Sodré station to Cascais. The journey is about 30km and takes approximately 50 minutes though there are a number of interesting stops on the way including some of the city’s most popular beaches. Cascais: During the era of the conquistadores the harbour town of Cascais was a lookout for Lisbon and tradition has it that the Royal family first began to bathe in the sea on Cascais’ glorious beaches. Today the harbour is filled with yachts and the beaches filled with tourists and locals who are also privileged to visit local castle ruins and a sea park. The most popular sea cliff in town is the Boca do Inferno or Hell Mouth. Carcavelos and Oeiras: While formerly known for its wine the town of Carcavelos is now more popular as a haven for surfers. Many surfing enthusiasts visit Carcavelos beach from all over the world to catch its substantial waves. On the east side of the beach is the Forte de São Julião da Barra in Oeiras, an enormous fort built to protect the Tagus River from invaders but which is now used as a government facility. Both can be reached by taking the Cascais train from Cais do Sodré. Search the Full List of Shore Excursions from Lisbon Port. Sintra: Declared a UNESCO World Heritage site Sintra was immortalized by Lord Byron as “Glorious Eden.” Living up to the legend Sintra contains many unique and breathtaking attractions. The most popular are the Moorish Castle and the Pena Palace which are considered the two peaks of the town and from which amazing views of the municipality and beyond can be seen. Other important places to visit include Palácio Nacional de Sintra, the Quinta da Regaleira, the Monserrate gardens and the Convento dos Capuchos. There are trains to Sintra from Rossio train station. Alternatively, cruise ship passengers can book a small group shore excursion which includes the highlights of Lisbon and Sintra. Estoril: Just 15km from Lisbon is the beautiful town of Estoril which is famous for being home to the largest casino in Europe. It is said to be the inspiration for Ian Fleming’s Casino Royale. Crowning the Central Parque do Estoril the Casino’s surroundings seem otherworldly with lush greenery and beautiful water fountains enveloping the restaurants, bars and other commercial establishments. Trains heading along the coastal line towards Cascais from Cais do Sodré station stop at Estoril. Fatima: In 1917 Our Lady of the Rosary was said to have appeared to three shepherd children just outside the town of Fatima. This miracle is paid tribute to in a great basilica whose esplanade is even larger than St. Peter’s in Rome, which also houses the tombs of the three children, Jacinta and Francisco Marto and their cousin Lucia Santos. Day trips to Fatima will include a grand tour of the basilica as well as visits to the houses of the three shepherd children, an ethnographic museum, several monuments and the chapel at the Cova de Iria, where Our Lady of Fatima was said to have appeared. There are trains to Fatima from Santa Apolonia station. 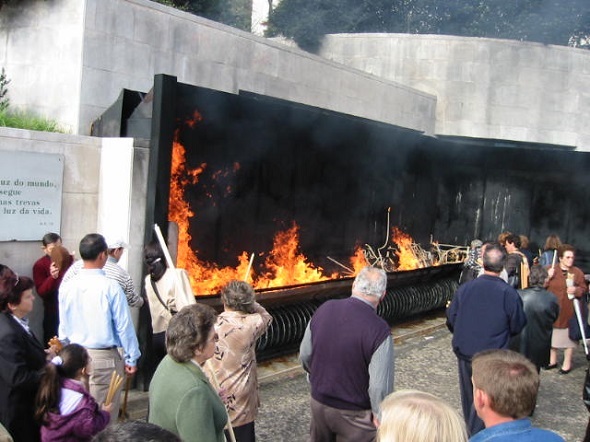 Cruise ship passengers can put together a small group for a private shore excursion to Fatima with port pick-up and drop-off. Queluz: Queluz is home to one of the most magnificent palaces in Europe, the Palácio de Queluz, which in its heyday saw the staging of grand operas in its halls and festivals, jousts and fireworks displays in its courtyards. Today, the palace is an important museum with royal collections in their actual settings displaying the styles of Portuguese furniture and interior design from the rococo to the neo-classical period. Queluz can be reached by train through the Lisbon-Sintra line, getting off at the Queluz/Belas stop. Evora: The city of Evora is a UNESCO world heritage site being home to several monuments each in a plethora of styles such as the Agua de Prata Aqueduct, the Giraldo Square, the Diana Temple, the Palace of Vasco de Gama and the Cathedral of Evora to name just a few. The city is surrounded by beautifully well-preserved medieval walls and was named the third most livable city in Portugal. Nazare: A very well preserved fishing village one of Nazare’s charms is you will find fisherfolk drying their day’s catch just yards away from sunbathing tourists. On the sea you will find the unique and colorful Phoenician style fishing boats which remain in use to this day due to the belief that the colors and paintings of eyes have magical properties against storms. Along the beach, on the Avenida Marginal, are an assortment of cafes and stores where a range of local food can be tasted. Obidos: Obidos is a charming medieval town on a hill. It has been well preserved through the years making the town a prime tourist location. Completely surrounded by a wall Obidos is said to be derived from the Latin “oppidum,” which means “citadel.” Once belonging to the moors the castle was taken by Afonso Henriques, the first king of Portugal. His grandson, King Afonso II, gave Obidos to his wife as a wedding present starting a tradition where the town was given to the Queen of Portugal many of whom generously lavished the town with donations. Lisbon Airport: Lisbon’s Lisbon Humberto Delgado Airport lies just 9km north of the city centre. Most international flights operate out of Terminal 1 although low-cost carriers including easyJet and Ryanair use Terminal 2. Airport Transfers: There is an airport bus that runs between the airport terminals and both the city centre and the Cais do Sodré railway station. The journey only takes about 20 minutes. Taxis are widely available and excellent value private transfers can be arranged in advance. Lisbon Hotels: Some of the most exclusive properties are located in the Baixa and Alfama districts. 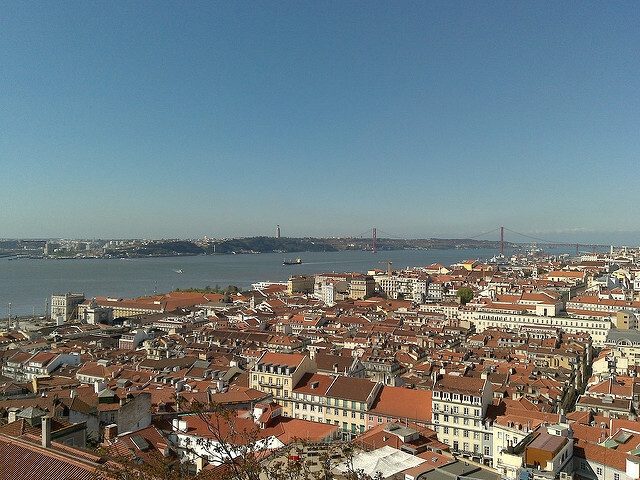 Take a look at Booking.com for the latest deals on Lisbon hotels. Fado Houses: Fado Music and Dance is a popular homegrown genre of music performed in Lisbon by a soloist. There are Fado houses all over the city which tend to open earlier than other bars because they serve dinner. Two recommended Fado houses are Clube de Fado in Alfama and Senhor Vinho in Lapa. Cultural Events: The highlight of your night out could be an exquisite classical music concert held at the Culturegest, or the Calouste Gulbenkian Museum, which is the main hub of art and culture in Portugal. If you’re a Theatre buff, the Dona Maria II National Theatre regularly puts on a varied repertoire of works, from plays of the classical period to contemporary and experimental pieces. Opera is regularly staged in São Carlos Theatre.